For the former unit of weight, see load. 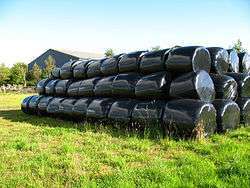 Fodder, a type of animal feed, is any agricultural foodstuff used specifically to feed domesticated livestock, such as cattle, goats, sheep, horses, chickens and pigs. "Fodder" refers particularly to food given to the animals (including plants cut and carried to them), rather than that which they forage for themselves (called forage). 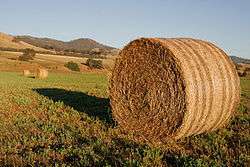 Fodder (/ˈfɒdər/) is also called provender (/ˈprɒvəndər/) and includes hay, straw, silage, compressed and pelleted feeds, oils and mixed rations, and sprouted grains and legumes (such as bean sprouts, fresh malt, or spent malt). Most animal feed is from plants, but some manufacturers add ingredients to processed feeds that are of animal origin. Seeds and grains, either whole or prepared by crushing, milling, etc. In the past, bovine spongiform encephalopathy (BSE or "mad cow disease") spread through the inclusion of ruminant meat and bone meal in cattle feed due to prion contamination. This practice is now banned in most countries where it has occurred. Some animals have a lower tolerance for spoiled or moldy fodder than others, and certain types of molds, toxins, or poisonous weeds inadvertently mixed into a feed source may cause economic losses due to sickness or death of the animals. The US Dept. of Health and Human Services regulates drugs of the Veterinary Feed Directive type that can be present within commercial livestock feed. Fodder in the form of sprouted grains and legumes can be grown in small and large quantities. Systems have been developed recently that allow for many tons of sprouts to be produced each day, year round. Sprouted grains can greatly increase the nutritional value of the grain compared with feeding the ungerminated grain to stock. In addition, they use less water than traditional forage, making them ideal for drought conditions. 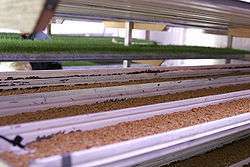 Sprouted barley and other cereal grains can be grown hydroponically in a carefully controlled environment. Under hydroponic conditions, sprouted fodder at 150 mm tall with a 50 mm root mat is at its peak for animal feed. Although products such are barley are grain, when sprouted they are approved by the American Grassfed Association to be used as livestock feed. On site system in the USA. ↑ "allaboutfeed.net". allaboutfeed.net. allaboutfeed.net. Retrieved 6 October 2014. ↑ "IFIF". IFIF.org. IFIF. Retrieved 8 October 2014. ↑ Logsdon, Gene (2004). All Flesh Is Grass. Ohio University: Swallow Press. Chapter 20. ISBN 0-8040-1069-2. Karl Heinrich Ritthausen (1872) Die Eiweisskörper der Getreidearten, Hülsenfrüchte und Ölsamen. Beiträge zur Physiologie der Samen der Kulturgewachese, der Nahrungs- und Futtermitel, Bonn, 1872 from Google books. Look up fodder in Wiktionary, the free dictionary. Wikimedia Commons has media related to Fodder.